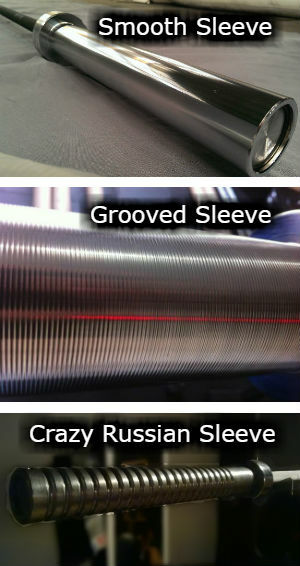 In recent years some manufacturers have added small grooves onto the sleeves of olympic bars, as shown in the pic to the left. People have also referred to them as ridges or ribbed sleeves. All the same thing. There have been questions from time to time on what that’s all about. To complicate things, Rogue unveiled their Russian Bar in 2016, which has huge grooves, a totally different animal than the little grooves we’ve seen for years. I’m going to call them Russian grooves here for the sake of simplicity. The Russians developed them decades ago, in the dark Soviet years (hey, something good came out of the Soviet Union!). Because there weren’t enough complexities in the design of olympic bars already, right? Each of these sleeve styles does have arguable advantages. Smooth sleeves are the classic design. Easy, relatively quiet plate loading. Not much to say about it! They’re my favorite. Experienced lifters don’t always use collars, for two reasons. For one thing, they have found that in certain situations there’s little or no need to secure the plates. The rationale is they don’t move much, and if you know there will be no problem at all in getting the weight up smoothly then it’s much like lifting with plates loaded unsecured on a weight machine, which tends to be seen as much more acceptable. But you need to be aware of when it is and isn’t perfectly safe to do this with freeweight barbell lifting. Doing heavy sets with unsecured plates when you have other people also lifting around you is a bad idea. Do what you like in private, but if you hurt someone else, you, sir, are a bad person. The second reason experienced lifters may choose to not use collars is as a safety precaution when bench pressing. 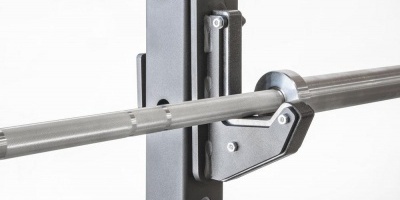 If they fail a heavy rep and are at risk of crushing themselves, tilting the bar to the side causes the plates to dump off one end, and with that end unloaded the bar flips the other way and the plates slide off that end. It’s a wacky way to do things, but it does work I guess, at the risk of damaging your plates and surrounding walls/equipment. It’s far better to lift in a power rack with safety bars or safety straps. When you do use collars on grooved sleeves, the grooves can significantly help keep some types of collars from slipping, notably any collars that can tend to catch on the grooves (such as the cheapo spring clips) or anything with a rubber padding that the grooves sink into. The problem with grooved sleeves is the “zzzzzzzzzzziiiiiipp!” sound plates make when you load them. With iron plates it’s annoying, because you often want to be able to slide a plate on with one hand, and it’s not easy to do that on grooved sleeves, or the noise you create is annoying. Plates with steel inserts such as any bumper plates and the Troy VTX rubber plates will slide smooth against them and won’t make noise. The third style is the old Russian design. Rogue decided it didn’t just look cool but has a notable functional advantage – that of securing your plates way better than any other design when you’re dropping the bar for multiple reps.
Here’s how the Russian style sleeves work. You need their special collars (which Rogue includes with the bar). Load your plates. Slide the collar on, locking them down into the last groove you can get to, which by design will be some distance from the plates. Then spin the inner part of the collar to move it snug against the plates. This is guaranteed to keep the collar from slipping when you drop cleans, because the pressure of one portion of the collar against the plates is backed up by the other portion of the collar being secured into that huge groove in the bar sleeve. It aint getting knocked loose. The collar would have to break first. I’m trying to include many top brands that I can get definitive info on here. If I made a mistake or omission, let me know and I’ll update the list! Note that this has changed over time. Troy and Vulcan both used to do grooved sleeves but have since abandoned them. I read the SS thread, but I won’t lie, I skipped the physics debate. I have a CAP barbell with grooves, and a SSB that is smooth. I don’t know anything about the cost to manufacture and all that; I consider the grooves to be a safety feature, because on any reasonably level rep, you don’t need collars (due to more friction than a smooth sleeve not less), but if you had to dump the plates so as not to die on a failed rep on a bench press or squat, you can tip up 1 end and they slide right off (not a problem for me, I lift in a rack). but the SSB, with smooth sleeves, requires collars on every rep.
downsides to the grooves: some find the noise of loading/unloading annoying, and if you’re not careful, you’ll occasionally get steel shavings splinters in the skin of your fingers (hurts pretty bad). I’m a smooth sleeve guy, mainly for the lack of noise. I always use collars, without which the plates shift easily, but then maybe that wouldn’t happen if I used a bar with grooved sleeves! I just happen to be using the Troy GOB-1800 now. I don’t generally collar my weights, except when deadlifting. 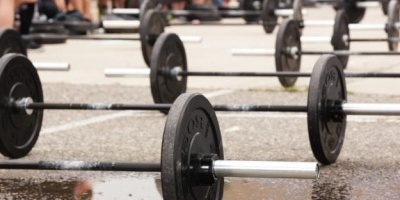 Even with the grooves, touching the floor between reps causes the weights to “walk” out a bit. Not so they’d fall off, but they get sloppy and distracting. For squats and overhead presses, I don’t collar and have never had a problem. For bench press, I would never collar the weights for the reason you mentioned. Even though I moved to benching in a rack, it feels safer not to collar (I lift alone). The real problem for me with grooved sleeves is the noise from adding/removing weights, which is a problem in my home gym at night. This thread on the Starting Strength board is about grooves sleeves, and quotes Rogue CS. I realize this is third hand info, but if true it does indicate Rogue is defaulting to grooved sleeves for newer bars. It’s a good thread, but I would ignore the discussion of coefficients of friction and centrifugal force, unless you’re into that sort of thing. I believe that most Rogue bars now have grooved sleeves, according to threads on other boards. Rogue doesn’t mention grooved vs smooth sleeves on their site, that I can find. John, could you share a link where it’s mentioned that newer Rogue bars have grooved sleeves? Sometimes it’s not clear when someone is talking about an older bar they have that they assume is the same as the newest version. Sorry, see my reply above, out of sequence. Thanks, and I also checked with Rogue today – They confirmed that they are making all the bars with grooved sleeves. So I need to update the article!